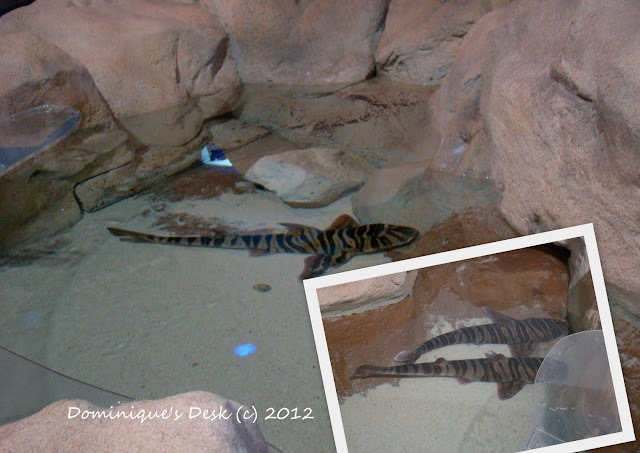 Two weeks ago we were invited to the Underwater World to view its latest attraction the Zebra Horn Sharks. It has been a few years since we have been to the place. I remember the last time we visited the Underwater world Doggie boy was still being pushed around in a pram!! The kids looked forward to visiting the place and I too was interested to see their latest exhibit. The kids waited around the Hawksbill sea turtle exhibit at the entrance while I went to ticketing counter to retrieve our complementary tickets. Once the tickets were in hand we could proceed inside the Underwater World to view the exhibits. We arrived there bright and early just after the place had opened so that we could be in time for the dolphin show at 11am. 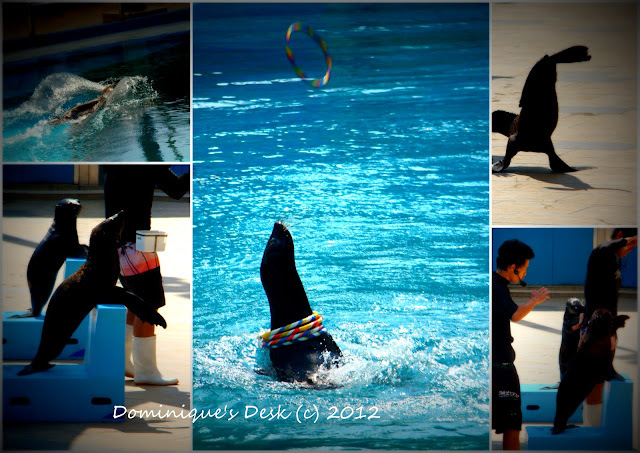 It was the first time that we were watching the dolphin show. 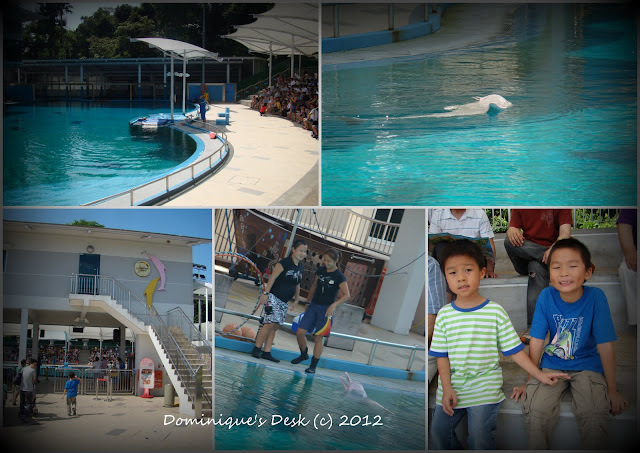 The previous time when we visited the Underwater world the dolphin lagoon was located in a separate location. The star of the show- The Pink Dolphin. 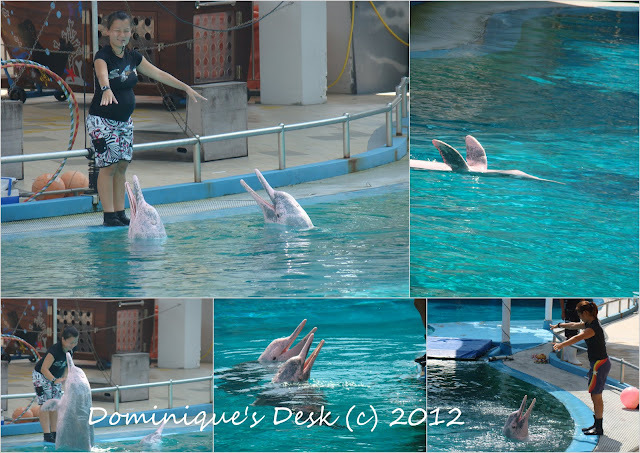 The pink dolphins with their trainer doing tricks in the performance pool. Besides the pink dolphins there were also two fur seal performing for the crowd. They performed a few tricks for the crowd and were great catching hoops around their bodies. After the dolphin show we proceeded inside to view the rest of the exhibits at the Underwater world. The kids were captivated by the Jewels of the reef and spent a lot of time gazing at the exhibits on display at this booth. They had to be prodded along as the storytelling session by Bookaburra was about to begin in the room next to it. The presenter read two different stories and there was a short art and crafts session at the end of the 2nd story. 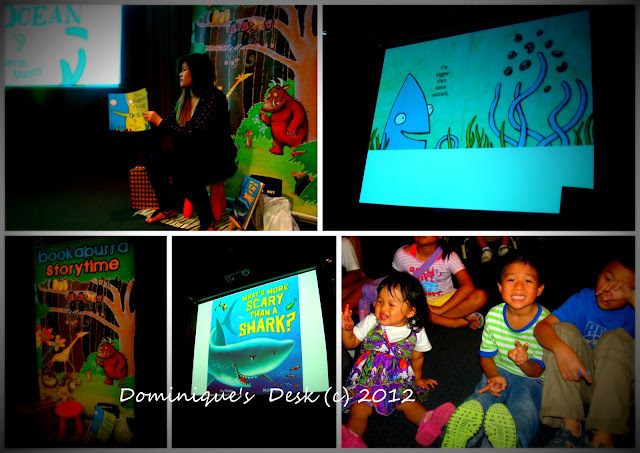 The kids were entertained by the animated expressions by the presenter when she told the stories. 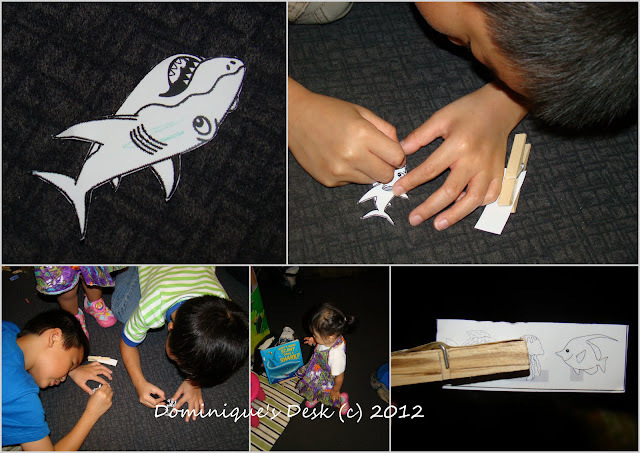 The kids got busy to creating their own shark eating “clip” after the story telling session ended. When the peg is opened you can see the fish/creature that the shark has “eaten”. After the art and craft session ended we continued our tour of the Underwater world. 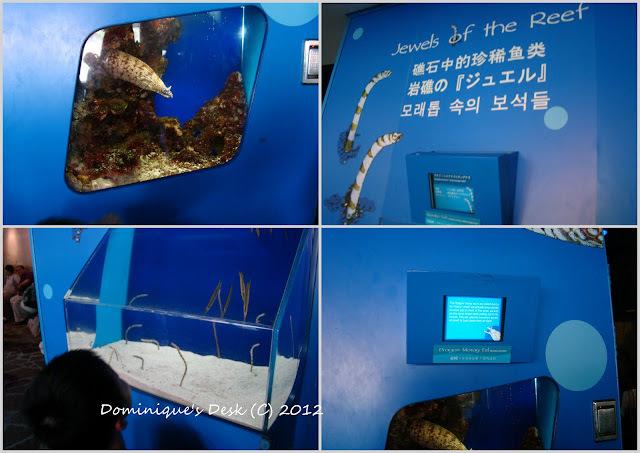 We went to view the oceanarium which has a revolving belt to bring visitors around the tank. The place seems much smaller then I remembered since the last time I viewed it. The kids weren’t too keen to view the shark and fishes in the tank and wanted to go off for lunch as they were getting hungry by then. As we headed towards the exit I suddenly remember we haven’t viewed the main exhibit that we were invited to see- the Zebra Horn Sharks. Where was that exhibit? The sharks were happily resting in the temporarily converted touch pool at the entrance. We didn’t realized that we skipped past them when we entered the place as there wasn’t any signage to alert us or inform us about their “star” exhibit. It could have been better presented if there were signs and displays leading to the exhibit. The kids had a fun morning at the Underwater world and they enjoyed themselves. It was a good ending to the June holidays. 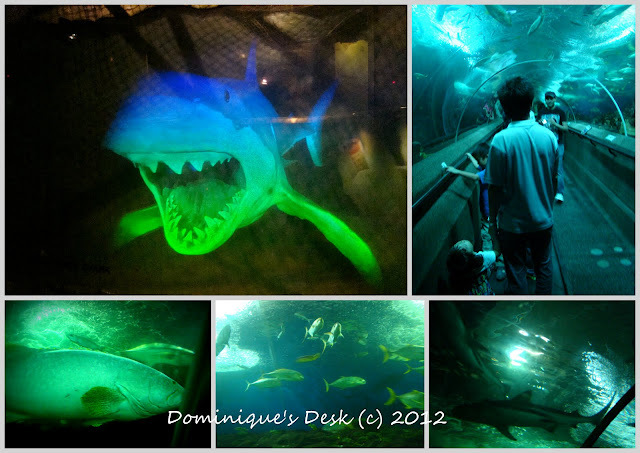 Disclaimer: Dominique’s Desk was given a media invite pass to Underwater World Sentosa. All opinions about the experience at the place are 100% my own. Great snaps there Dominique. You really had so much fun observing how wonderful these sea creatures are. Love reding your post! Cheers! Exciting outing beautifully recorded. Thanks for the great visual treat! Wow! It must be fun watching all these underwater creatures. I have been to Philippine’s and Dubai’s Oceanariums, but I’ve never been to Singapore’s. I wish I can visit one day. The pictures are wonderful! My daughter has been wanting to visit the aquarium. You made me feel like taking her! Amazing pictures Dominique ! Singapore has one of the most beautiful things to showcase to the tourists and this is one of them.